First Love Missions: Demonized or Demon Possessed? The difference between being 'possessed' and being 'demonized' is the aspect of control. The original Greek word that has been wrongly translated in the KJV (and every other version) is "daimonizomai", which translated correctly means "to be under the influence of an evil-spirit or demon". There is no indication of some kind of zombie-like, complete control (possession) in the Greek. We all know people who are saved that still consistently act with 'non-Christian' characteristics: jealousy, covetousness, anger and pride are but a few examples. There are those that suffer from past inflictions from childhood or past relationships: rejection, fear, self-pity, lack of confidence and desperation. There are those that are inflicted with what seems to be constant illness and still others suffering with addiction. Others suffer from Spiritual afflictions like confusion, doubt and unbelief. 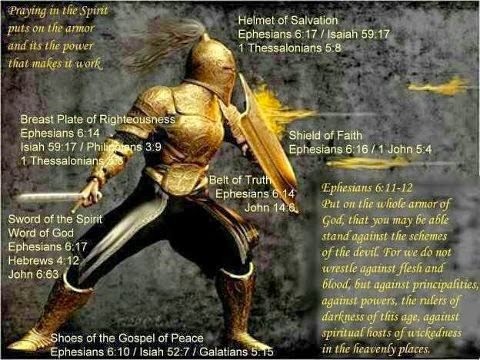 Any Christian that doesn't believe that we can be demonized should ask themselves one question - why do we need the armor of God? Paul was speaking to saved brethren when he spoke in this regard, so if we are immune, why do we need the armor at all? If, when we come to Christ, we are fully protected, who or what are we guarding ourselves against? As my Grandmother used to say, "the proof is in the pudding" - and there's some scary pudding out there. The truth is that we're not immune to demonic infestation and in fact, as we do more and more work for the Kingdom, we become demon magnets, attracting everything from physical attacks like constant itching or muscular stress and headaches to Spiritual attacks that can keep us from doing ministry or being effective. 4) Not afflicted before but afflicted after by way of attack for doing the work of God. The first two have a real problem relating to the third & fourth. Their course of action is to tell the afflicted to ‘get a grip’. Rather than ministering deliverance, they ignore the issue, hoping the afflicted will somehow 'get better'. Christians who have never experienced demonic attack have a real problem with those that have – they just can’t relate. As a result, demonized Christians are ignored, shunned and forgotten. When Christ left earth He gave all authority to us that remain here to act on His 'power of attorney'. In fact, He not only commanded disciples to cast out demons but went so far as to say, in Mark 16:17-18, that along with healing the sick, speaking in tongues and not fearing any deadly thing (poison) that casting out demons is a sign that will follow those that believe. We need to be striving to be more like Christ - and acting with the authority that He has given us. How else is the Kingdom going to come on earth if not by us taking up the charge and commanding it with the power that Jesus vested in us. This is the very reason why we're still here and didn't get swooped up to heaven the second we accepted Christ. Don't waste that. Cherish it and use it for the good of the body. Jesus is counting on you.